A complete and absolute delight, this is a treasure of a read. Tom and his fifteen year old daughter Hannah believe in the magic of the theatre, of creating moments in time that live forever in the memory, when everything comes under threat, can magic prevail? This is one of those wonderful occasions where I just read for the pure spellbinding pleasure of reading. No notes, no overthinking, just cosying in a chair with a beautiful book. 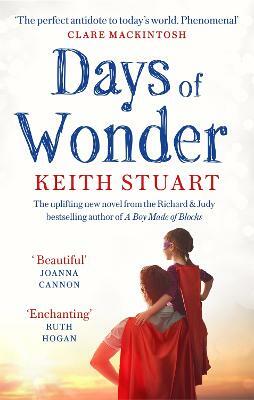 We've been lucky enough to ask Keith Stuart some questions about his life and experiences as an author. Did you ever plan on being a writer? Can you give us an overview of how you got into writing - game writing and/or novels? 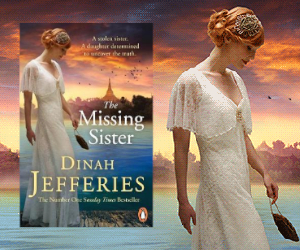 I’ve definitely always been interested in writing stories – I used to really love writing these epic adventure yarns when I was at junior school, but then as I got into my teens I really struggled with senior school and lost all my enthusiasm really. I started writing again while I was at university – during the summer breaks, I’d go and work at a friend’s computer game development studio and I wrote all the stories and dialogue for their projects. Then when I left university with a degree in English and Drama I had no idea what to do so I applied for a job on a video game magazine named Edge and I got it. I just sort of fell into games journalism really! Then I went freelance and managed to pitch an article to the Guardian, where I spent the next 15 years as the newspaper’s games editor. Then in 2012 my oldest son Zac was diagnosed on the autism spectrum and we discovered that video games were a huge help to him – they relaxed him and made him interested in growing his vocabulary so he could talk to us about games. He especially enjoyed Minecraft and I wrote an article for the Guardian about how that game had affectively changed his life, and also helped us to bond as father and son. Ed Wood, an editorial director at Little Brown read the feature and thought it would make the basis of an interesting novel, so he contacted me and asked to meet. He said, let’s try and think of a story where a father and an autistic son bond over Minecraft – something that uses your experiences but it fiction. That’s where Boy Made of Blocks came from. 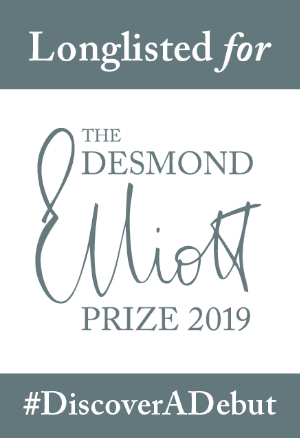 It was Ed’s idea, and his passion and faith that got me into writing fiction – I’d never thought about writing a novel before! How hard did you find the transition between writing about games and writing novels? The hardest element is the difference between non-fiction and fiction. With the former, you need to think about facts and evidence – everything you write needs to have supporting data, so it’s a very regimented way of thinking. But with fiction, you can’t quote experts, and you make everything up – that was so weird to me! I’d sit and write a chapter and think – this is ridiculous, none of this actually happened. It took me a while to get out of that mindset. In the end, I almost approached each chapter in Boy Made of Blocks like a 2000-word feature – because that’s how writing worked for me! But actually, my knowledge and skills as a journalist were really helpful in the end – I understood about the importance of structure and how to order things to have the greatest impact – and those are elements that are often overlooked by fiction writers when they first start out. Structure is profoundly important. Could you tell us a bit more about your writing process? It’s a bit of a mess to be honest, as I’ve always had to fit it around my day job as a Guardian contributor. I really like to write in public places, whether that’s a coffee house, library or – if I need a little extra creative help – a pub. I write from the beginning of the book to the end, I very rarely skip ahead, even if I get a good idea for a later chapter – I’ll just note that down somewhere. I’m not great at planning so I tend to discover stuff as I write, so my first draft is really bloated and clumsy, but I use it as a preparatory sketch really. Then I go back and start tidying everything up and re-structuring. It’s not a very efficient process and I had to cut about 20,000 words from Days of Wonder, but it’s the only one that works for me. In video games there’s a concept known as iterative design, which means coming up with a rough prototype game then just continually tweaking it until it’s right – that’s definitely how I design stories! Do you prefer Hardbacks, paperbacks or eBooks? As a reader, definitely paperbacks. I have to admit, I’ve never got into eBooks – I love the tactile feel of a physical book, they are beautiful objects to me, and they carry all the memories of the times you read them. I have a copy of James Ellroy’s novel Black Dahlia, which is all smeared with suntan lotion because I read it on holiday in Italy with my family and my wife (then my girlfriend), and it still takes me back there. I’ve got more into hardbacks recently, because they’re beautiful design objects, and because there’s a lot of exciting literature around at the moment. I bought Holly Bourne’s How Do You Like Me Now, Sally Rooney’s Normal People and Daisy Johnson’s Everything Under because they all looked beautiful and they are really interesting novels. Do you have any strange book habits? Well, I don’t know if this is strange, but we have a little bookcase in our bedroom and often I’ll just sit at the end of the bed and browse books for an hour before going to sleep – just going through and re-reading favourite paragraphs. I find it really relaxing if I’m having trouble sleeping. I think this is, again, about how I inextricably link stories with memories. It’s kind of like looking through a photo album I suppose. Maybe it’s a form of self-therapy?! What was your favourite book from childhood and do you still have a copy? I was much more into comics when I was a child and read 2000ad religiously, as well as a bunch of Marvel comics. But I had an old copy of the Magic Faraway Tree that I absolutely loved – I know Enid Blyton is very problematic in modern terms, but she was amazing at constructing story worlds that children felt they had space to explore and reimagine. The Enchanted Wood was essentially my Hogwarts! I also really loved Down with Skool by Ronald Searle as it was so irreverent and anarchic and its public school setting was so alien to me. Sadly my copy of that book fell apart some years ago so I bought a lovely Penguin classics edition of Searle’s complete Molesworth series. That gets browsed regularly before bedtime! If you could read a book by anyone, fictional or not, who would it be and why? I’m really interested in historical figures who are mostly known and understood through their relationship with others – and let’s be honest, due to the largely patriarchal nature of history that’s often women. So I’d love to read a book by Emma Hamilton, I bet that would be fascinating. Tom and Hannah became real to me, they lived in my mind. How long do characters remain with you after you’ve finished writing them? I think Tom and Hannah are still with me! It’s funny because, before writing a novel, I used to find it quite pretentious when authors said in interviews that they “missed” characters they’d created when they finished writing a book – but now I completely understand what they mean. You really have to put yourself into their lives to make them feel real and Days of Wonder was so hard, I really had to spend a lot of time thinking about Tom and Hannah and being in their heads. With Hannah especially, I still think about her a lot because she is so different from me and I put so, so, soooooo much into making her voice work. I remember almost all her dialogue off by heart. 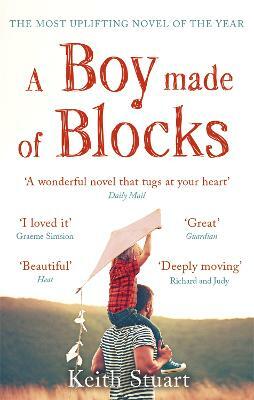 With Boy Made of Blocks, it’s all so blurred with reality because a lot of the experiences are based on things that happened with me and my son – so I guess Sam and Alex are living on, to some extent, in me and in Zac. I love the synopsis for the paperback of Days of Wonder as it allows you to properly discover the story. How did the characters and storyline introduce themselves to you (without giving too much away, if possible)? Well, after I finished Boy Made of Blocks, I sat down in a pub with my editor, Ed Wood, and we just chatted about what to do next. We were sure we wanted to do another family drama, and I wanted it to be about a dad again because I had that experience and it gave me something familiar to work with. We thought about lots of scenarios with different children, and we fairly quickly settled on the dynamic between a single dad and a teenage daughter because it’s so full of interesting stress points! My wife’s friend Sarah had told us about undergoing hole in the heart surgery as a baby and then again as a teenager, and she mentioned how her parents had refused to speak to her for a week because they’d caught her smoking, and it was so dangerous for her as a child with a heart condition – this really struck me as a fascinating conflict. Also, I’m a Man City supporter and in 2003, a player named Marc-Vivien Foé died of undiagnosed cardiomyopathy during an international match, and that really affected me – he was such a great player. It seemed so tragic that someone so fit and strong could be struck down in this way. I learned about how teenagers with serious cardiomyopathy have to live with this constant threat and I wondered about how someone would live with this possibility. That’s really how Hannah came about. Tom is basically me when I studied drama at university – a bit unrealistic and useless but full of ideas!